Your professional experience and your title seem to have less impact on getting leaders to listen to good communication advice than you would like. What to do? It helps to speak their language—numbers—to get their attention. And then you need to use more effective techniques for presenting your solutions and being ready to address their objections. 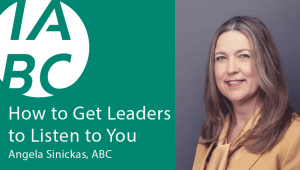 Join us June 20 for a session with internationally recognized measurement expert Angela Sinickas, ABC. Angela’s session will share examples of how to gather research quickly and effectively to make yourself more credible when you advise your management team. Consulting: ways to improve listening skills and use the rule-of-3 for probing questions when a leader first asks for our help. Research: ways of doing informal research to identify emerging issues or pretest potential messages, using pilot/control groups to test solutions, using business data from the last time your advice was not listened to. Persuasion: how to present leaders with alternatives instead of only one solution, how to “chunk up” to higher objectives or “chunk down” to attractive characteristics of competing solutions so that you and your leadership feel the right solution has been agreed upon. Angela Sinickas, ABC, has been called a pioneer, guru, maven and even a diva of measurement. She is a globally recognized consultant on practical ways to measure the impact of communication on business results. Her client list includes 25 percent of Fortune’s 100 largest global companies. She has conducted workshops on measurement in 32 countries and has written over 150 articles about strategy and measurement. Angela’s work has been recognized with 21 IABC Gold Quill awards, in large part because she practices what she preaches and measures the impact of the work she does. She was named a Fellow of IABC in 2008.